This April, Sotheby's will illustrate the evolution of decorative arts collecting with the auction Style: Silver, Ceramics, Furniture. Spanning a range of periods and tastes, the sale brings together English, European and American silver and ceramics, classical 18th and 19th century English and Continental furniture, as well as several outstanding single-owner collections. To show the beauty of an eclectic interior, Sotheby's combined highlights across the categories, photographed and styled with a contemporary lens. Ahead, discover unexpected pairings featuring Meissen, Georg Jensen and more. A George III satinwood and harewood demi-lune sideboard, late 18th century. Estimate $12,000–18,000. A Meissen chinoiserie teapot and cover, circa 1723-24. Estimate $20,000–30,000. An early Irish silver large coffee pot, David King, Dublin, 1706-07. Estimate $10,000–15,000. A Meissen chinoiserie circular stand or plate, circa 1728. Estimate $25,000–35,000. A Meissen chinoiserie circular dish, circa 1735. Estimate $20,000–30,000. A rare Meissen chinoiserie coffee pot and cover, circa 1725-28. Estimate $15,000–25,000. An unusual Irish silver footed coffee pot, Robert Calderwood, Dublin, 1728. Estimate $12,000–18,000. An Italian 18-karat gold, enamel and gem-set geisha, Alessandria, 20th century. Estimate $7,000–10,000. An early Meissen porcelain white sake bottle, circa 1715-20. Estimate $15,000–20,000. A Meissen chinoiserie circular dish, circa 1735. Estimate $20,000-30,000. A Danish silver tea caddy, no. 7, Georg Jensen Silversmithy, Copenhagen, circa 1915-19. Estimate $3,000–5,000. A set of four George III mahogany wheel-back hall chairs, late 18th century (one of four shown). Estimate $6,000–9,000. A pair of monumental French Napoleon III gilt bronze and champleve enamel vases by Ferdinand Barbedienne, third quarter 19th century. Estimate $20,000–30,000. A Meissen figure group of a shepherd and shepherdess, circa 1744. Estimate $20,000–30,000. A pair of bow figures of pugs, circa 1750. Estimate $5,000–7,000. A Meissen figure group, 'The Hand Kiss', circa 1738-40. Estimate $30,000–50,000. A pair of Louis XVI mahogany jardinières, late 18th century. Estimate $5,000–8,000. 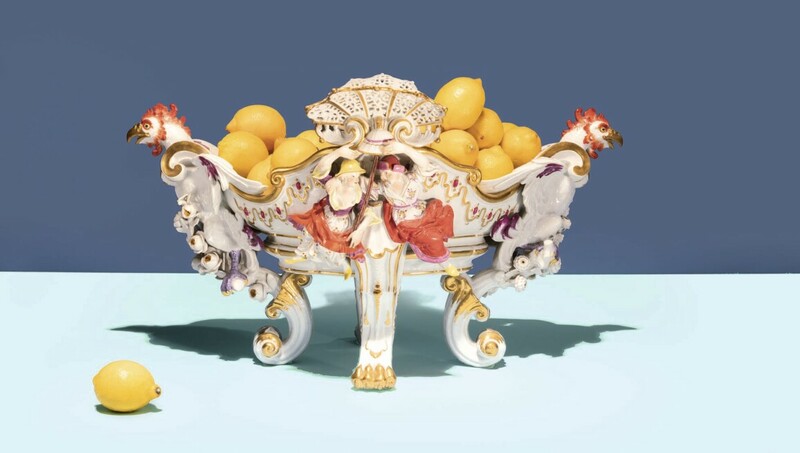 A Meissen large lemon basket, 19th century. Estimate $7,000–10,000.